Hey guys it’s me again Novi. I would like to talk to you all about our lord and savior Neptunia the CPU of Planeptune. You better listen or I am gonna nep you up. Personally I prefer Vert wehn considering the main 4 CPUS. Nah I kid I just wanted to talk about this game because I just managed to finish it up and get the platinum this past week. SO a quick overview for those who have are not familiar with the series is that The Neptunia series which started with Hyperdimension Neptunia on the ps3 is a game about a fictional world in which the console wars are ongoing. Each console is a country. note there are 4 in this case as in Neptune of Planeptune being Sega as in Sega Saturn. Noire of Lastation (Sony ), Blanc of Lowee (Nintendo) and Vert of Leanbox (Microsoft ). They each have their own personalities dislikes and likes. The main games play like turn based RPGS where the characters have a move range and attack range to use on their turn. its pretty straight forward. The girls also have a transform mechanic as well as their sisters the CPU candidates (the handhelds of the console companies). This however is a spin off of the main series and is an action game. This is the third action game spin off the series has had too. the previous two were only Sony’s VITA rest in peace in heaven sweet little baby angle. So this game is pretty damn meta. All throughout the series the CPUS and the candidates often talk about playing the video games their countries produce. Its a very constant thing the world itself is called Gamindustri. Like they will mention Lowee (Nintendo) for having games the whole family can enjoy. Lastation (Sony) often talks about being on the cutting edge of technology. Leanbox (Microsoft) first person shooters and about being able to allow players to communicate with each other like the early days of xbox live allowing voice chat and things of that ilk. Sadly for Planeptune (Sega) they often just talk about how fun things are. To be honest I did have a lot of fun on all the Sega consoles I played. So finally in the series about the patron goddesses of the world of Gamindustri. Saving the Gamindustri from things like the console wars, Piracy of the goddesses Arfoire and other emulators, corporate overlords and the like. We finally get a game about them playing an mmo. It’s pretty damn fun too! So in this game most characters aren’t changed all that much but they are now playing a class like you would pick in an MMO. Neptune who is normally a fighter uses katana or great swords in the game she is a paladin which limits her to just the big swords but gives her magic to cast now too. Noire normally uses a rapier but chose to be a Spear wielding Dark Knight. Vert Who is normally the spear wielder chose an enchanter which is more of a support role that uses a rapier and magic. Blanc who is normally a hammer wielding mage went full support and plays a cleric. So for some characters it’s a big shift for them and they even comment on it in game. For the CPU candidates Nepgear (Sega Game Gear) normally uses beam swords she picked a mage so she is all magic. Uni (Sony PSP) normally uses a rifle she is also a gun nut so she went with a dual pistol thief in this game. Rom and Ram are (Nintendo DS) are both normally mages like their big sister Blanc but they went went with a samurai and ninja. This game takes place after Megadimension Neptunia (Ps4) the newest main line entry in the series. I think... I never beat the main games to be honest i watch me sister play them and my sister watches me play the spin off action games. The game is really enjoyable and its done on the Unreal Engine 4. They even have a dungeon called Unreal world which looks like it is made up of stock assets for testing. see how meta that is. 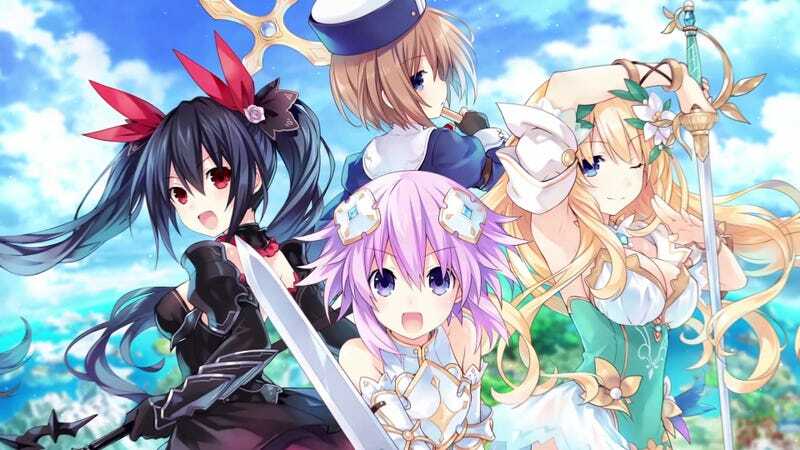 The story of the game is that the CPU’s and friends are all playing a in the beta for the new MMO 4 Goddesses online. Of course something in the game itself causes them to have to band together and save the world. The game like i said is more of an action rpg at this point no ones base combo changes but as they level up they gain new skills. I enjoyed playing Uni a lot because she has a damn near infinite combo as long as you have some SP to spare. The game also has online play normally in the campaign you have 4 characters out you controlling one and the AI acting according to what behavior you are on. Online allows you to take your 1 character and go do quests with other players. in this case it seems pretty damn fitting as well. I liked the game enough to beat it. Then complete all the quests. Pray fifty different times. Make sure everyone learned all of their skills and more. I could really see them doing another follow up to this as well. I even got Uni over level 100. So yeah if you are interested in the series you may be able to pick up for cheap later. If you are looking to get started they did remake the fist few games for pc i believe look for hyperdimension neptunia rebirth for the main series.